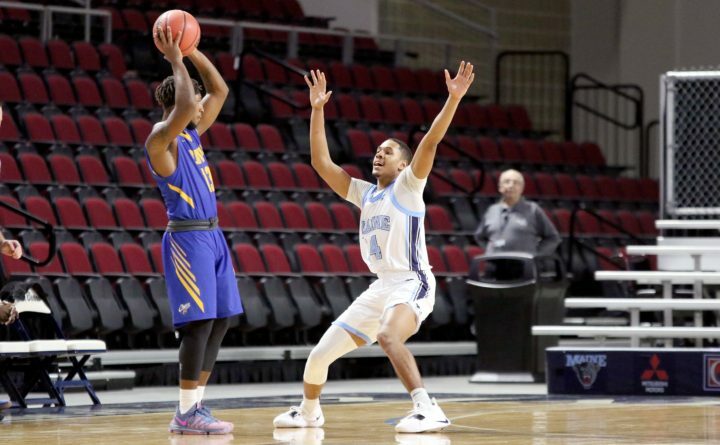 Isaiah White (right) of the University of Maine plays defense against a University of Maine at Presque Isle player during a game earlier this season. Ernie Duncan knocked down six 3-pointers on his way to a game-high 26 points on Wednesday night, powering the University of Vermont to an 86-63 America East men’s basketball victory over the University of Maine at Patrick Gymnasium in Burlington, Vermont. Anthony Lamb connected for 24 points for the Catamounts (18-5, 8-1 AE), who shot 58 percent overall (28-for-48), including 14-for-22 accuracy (62 percent) from the 3-point arc. First-place Vermont seized the upper hand early and built a 16-point halftime lead before extending the advantage to as many as 28 points in the second half. Vermont, which has beaten UMaine 16 straight times in the series, also received nine points each from Isaiah Moll (5 rebounds) and Stef Smith. Isaiah White led coach Richard Barron’s Black Bears (5-19, 3-6 AE) with 21 points, four rebounds, three assists and three steals. Andrew Fleming made four 3-pointers en route to 16 points and grabbed four rebounds. Sergio El Darwich contributed 11 points, five rebounds, three assists and three steals for UMaine, which shot 42 percent (22-for-53) from the floor and hit seven of 14 3-pointers. However, Vermont outrebounded the Black Bears 31-24. The Catamounts build a more comfortable lead in the second half, keyed by a 7-0 run. Vincent Eze’s layup had gotten UMaine within 56-42 with 15:33 remaining, but the Catamounts refused to let it get any closer. Everett Duncan made a layup off Lamb steal, then another steal by Lamb led to Everett Duncan’s 3-pointer. Vermont eventually got a layup by Robin Duncan off a pass from his brother Everett Duncan, then Moll made a free throw that gave the hosts a 64-42 advantage with 11:25 to play. The Black Bears weren’t able to get closer than 19 the rest of the way. UMaine hosts UMBC at 1 p.m. Sunday.